"There are also others who know something" - Severus Sebokht, 662 A.D.
As well as its overall geometric layout, the D&M Pyramid has features that look like ruined structure in higher resolution imagery. Today’s “image of the day” was taken by the Mars Reconnaissance Observer’s HiRISE camera. Some areas of the D&M Pyramid’s facets are covered with four sided raised grids, giving their surfaces an archaeological appearance. The individual cells in the grids range from house sized to room sized. These grid structures are consistent with the theory that the D&M Pyramid is a two mile long arcology. Arcologies are massive (self contained) habitations that can house substantial populations – a town or city contained in a single building. A five part analysis of the HiRISE imagery of the D&M Pyramid can be read by clicking on the following "stargate". It contains much more information than can be covered in this short caption µµµ. As always with these outsized images the reader is advised to use the "View" then "Full Screen" options from the menu bar at the top of their browser screens to see more of the image clearly. Alternatively, press the F11 key to enter the Full Screen mode, and then F11 again to return to the normal view. To make web pages/images Larger or Smaller click next "button"
Mars. Ruins of an Ancient Spacefaring Civilisation? Navigating the Cydonia Quest website. Most of the hyperlinks that enable readers to navigate around Cydonia Quest are in the form of "stargates". In some internet browsers - such as Internet Explorer and Chrome - these are displayed as star-like symbols (as intended). However, in some browsers - such as Firefox - the "stargates" are displayed as "U"-like symbols. My access to the World wide web began in April 1998, just as the first images of Mars began to come back from the Mars Global Surveyor (MGS) spacecraft. This access allowed me to discover through The Enterprise Mission (TEM) web-site that the theories of Richard Hoagland regarding Cydonia, hyper-dimensional physics and cover-ups had developed in weird and wonderful ways in the years since the publication of Hoagland's "The Monuments of Mars". The TEM web-site had enough material on it to fill several books, but with the exception of the articles on hyper-dimensional physics, none of this new work had been drawn together or indexed in any way. This is too formidable a prospect for anyone new visiting the TEM web-site. Firstly, to categorise, summarise and analyse the TEM theories. Secondly, to publish my own and others research into these theories on to the web. .....the issue of Richard C. Hoagland !! 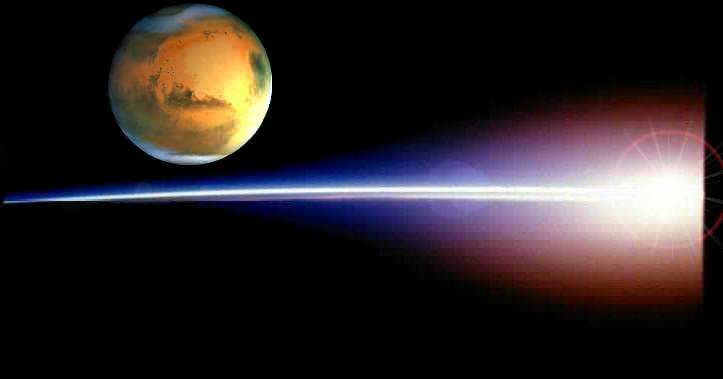 For two decades Mr. Hoagland has been the "evangelist" for the hypothesis that artificial looking formations on Mars are just that - artificial. Many of the sober scientific minds that have been drawn into this research (including members of the Society for Planetary SETI Research) were first introduced to the topic through talks given by Hoagland. It is therefore unsurprising that many in the Cydonia community have been shocked and dismayed by Hoagland's newer, outlandish theories that rival the "X" Files. It sometimes appears as if Richard Hoagland is asking his readers "to believe six impossible things before breakfast". I do find that the evidence for TEM's more sensational claims is usually more ambiguous than is justified by the conclusions reached by TEM. Carl Sagan is infamous for declaring that "extraordinary claims require extraordinary evidence". I think that this can be more usefully rephrased as "finding convincing evidence for extraordinary claims is extraordinarily difficult". As TEM sails further into uncharted waters I think that this problem explains much of the hostility that they face. Personally, I enjoy reading the Enterprise Mission web-site and have discovered many intriguing facts that I wouldn't otherwise have known. I've learnt to view the conclusions from TEM's investigations as thought experiments....and to my surprise some of it is better grounded than one might imagine. In this web-site I will, therefore, consider one or two improbable things before breakfast. Note: This website is best viewed at a screen resolution of 800 x 600. Higher resolution settings will reduce both the size and quality of the images displayed, thus leading to a loss of detail. For tips on adjusting screen resolution and other ways of improving the screen appearance of the internet click this "stargate" µµµ. Since the 25th February 2001, you are the "Nth" visitor to this menu page as shown below. I hope that you find Cydonia Quest a stimulating and informative read.